City Fruit advocates, supports and promotes urban fruit gardening. The benefit of a knowledgeable and kind staff gives Seattle a partner in teaching and harvesting fruit for all. As volunteers come together it’s good to have reliable and educated resource to advance urban fruit production. Good work, City Fruit! 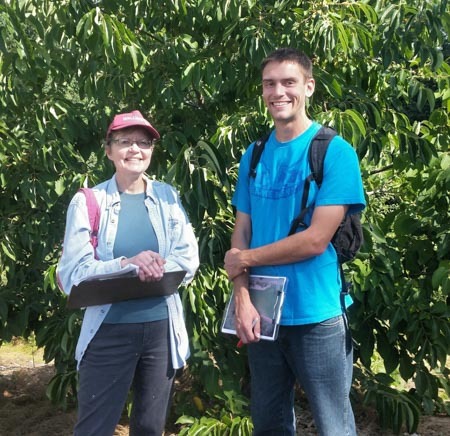 Barb Burrill (Orchard Advisor) for Cityfruit and Ethan Davis (Americorp Vista summer staff) spent the day measuring and identify Orchard progress. Once mapped this information will aid the City of Seattle in the effort to increase the tree canopy and urban fruit production.